This is the second visit by the independent transport videos cameras to this excellent event based at the Art Deco style bus station in Taunton. Our filming starts at the beginning of the day’s activities at the bus station in Tower Street. We see a superb line up of former Tilling fleet vehicles, all of Bristol/ECW manufacture. 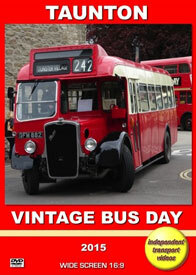 These include Western National, Crosville, Southern Vectis, Hants & Dorset and Bath Services. Buses and coaches are arriving all the time to provide a spectacular view of times gone by. Other buses and coaches from other manufactures and operators are also seen lined up on Castle Green. These are representatives from the fleets of Bournemouth, Darlington, Exeter, Huddersfield and Stockport Corporations, as well as North Western and independent Island Queen. London Transport is also represented with RTL1163 and a host of other vehicles and fleets that you will see as the day progresses. Our filming locations include the bus station, Tower Street, Castle Way, Castle Green, Corporation Street and Fore Street. We take a ride to Bishops Lydeard railway station onboard former Western National Bristol FLF6G, 2019 (824 KDV) which has ECW H68F bodywork. This is currently owned by Firstbus and is based in Cornwall. The ride is filmed in the busy lower saloon where we see the conductress hard at work with her Setright ticket machine! Back at Taunton our filming records the almost non-stop action of these superb vehicles coming and going. We have also included the current First buses in service in the town. Most of them are in the smart new two-tone green livery, branded as “Buses of Somerset”. We now take a brief journey out on former Crosville KA244 (LFM 320), which is a Leyland PS1/1 with Weymann DP35F bodywork. Ordered by Midland General, but delivered to Crosville, it was used on express services in north Wales. This trip was for a photo shoot for the popular enthusiast magazine ‘Bus & Coach Preservation’. Now back at the bus station we see brand new demonstrator, 36300 (BF63 HDC) a Wright bodied Volvo B5TL Euro6, which is currently on loan to Buses of Somerset. Our final ride of the day is on board another former Crosville vehicle. This time it is GFM 882, a Bristol L6A with a forward entrance ECW body seating 35. This bus was converted to front entrance by Crosville in the early 1960s and sold to Thames Valley as their S302 in 1963. Smartly turned out in Thames Valley Tilling red and cream livery, we board the bus at Castle Green for an enjoyable journey down single-track roads to the village of West Monkton in the delightful Somerset countryside. We are in the company of Crosville KA244, both vehicles looking at home running down the lanes, just as they would have done in their Crosville days, and S302 in its days with Thames Valley. Our final filming takes place in and around the bus station in Taunton where it all started some six hours earlier! We hope you enjoy your day! Duration : 79 minutes (approx).